This frosted Céad Mile Fáilte Irish blessing sign with shamrocks would make a great suncatcher. Sorry, this Irish welcome sign is now sold out. Céad Mile Fáilte is One Hundred Thousand Welcomes in the Irish language. This Irish welcome blessing features a frosted design with shamrocks and Céad Mile Fáilte on simulated stained glass. 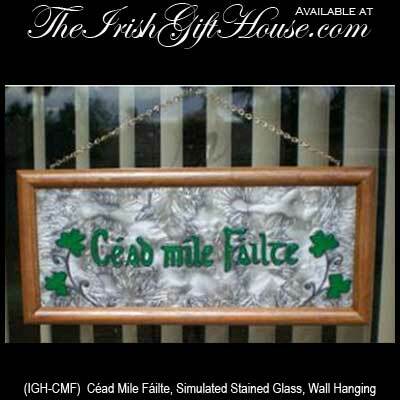 The Céad Mile Fáilte sign is complete with a hardwood frame and measures 22” wide x 9 1/2” tall. This Irish suncatcher is ready to hang with the included bracket (the chain in the image is not included) and is made in the USA. This Irish blessing plaque is complete with a shamrock history card that is complements of The Irish Gift House.